The Salkantay Trek is as much an expedition for the soul as it is a test of physical endurance. I couldn’t have asked for a better experience, and that is most likely due to the wonderful team at Salkantay Trekking. Once upon a time, when I lived in Cusco, Peru, my mother came to visit and we decided to trek to Machu Picchu. Since I had already visited Machu Picchu for $100 with some friends via a bus, I wanted my second trip to be more adventurous. So after a lot of research on the best treks (their are multiple options for trekking to Machu Picchu), and talking to people who had done them all, I chose the Salkantay Trek. The trek itself is cheaper and less popular than the more famous Inca Trail, but I’m not sure why because it takes you through glacial lakes, to the bottom of the Salkanaty glacier, through the edge of the Amazon Rainforest, hot springs and ends at the indescribable world wonder of Machu Picchu. Salkantay Trekking put us in a group of 8 wonderful people with a very colorful guide that made the trip all the more enjoyable. The first three days were full of adventure in the form of hiking up steep terrains in high altitude, avalanches, and transportation strikes that included barricades made up of boulders on the road to Santa Teresa. 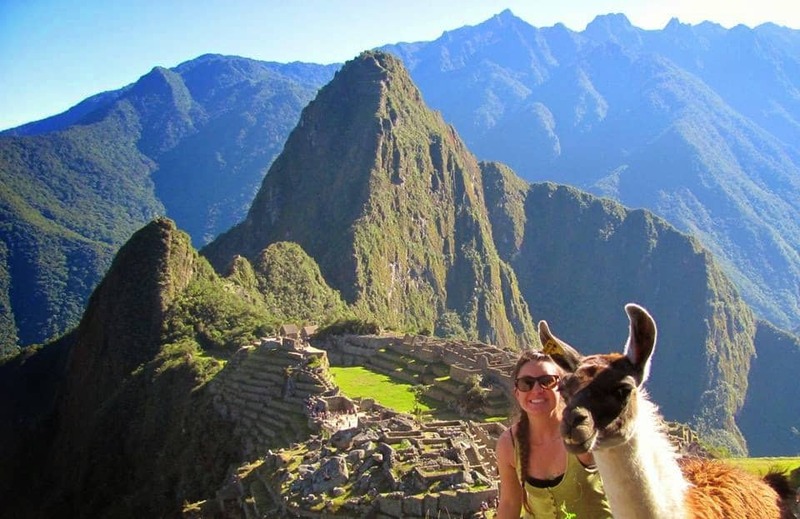 Day 4 is a light walking day and day 5 is all about exploring the ancient ruins of Machu Picchu. Each day included three home cooked meals and an awesome team that set up our tents and woke us each morning with coca tea. Day one: was a wonderful intro into the difficulty of day two but with the added bonus of an evening hike to a glacial lake. Day two: we reached the base of Salkantay Mountain (the highest point at 4,600 meters) and offered up 3 coca leaves to the sacred Inca mountain gods. Day three: consisted of a casual 5-hour hike through the edge of the Amazon to Santa Teresa, followed by a 3-hour soak in the surprisingly nice hot springs there. Then after our 3-course meal we played a German dice game called “lying max” over a box of Chilean wine. Day 4: we ziplined our way over the tree canopies in the morning, walked along the train tracks to Aguas Calientes (the town at the base of Machu Picchu Park) in the afternoon, and took an epic shower in what felt like a luxury hotel in the evening. In reality, it was just a hostel with warm water and wifi (but after a few days of trekking, luxury becomes a relative word). Day five: we woke up at 4 am to be the first to explore Machu Picchu. We arrived at the entrance of the park at 5:45am via bus just in time to catch the sunrise. There is also an option to hike up 1,000 Incan stairs before sunrise for free, but be warned that you will pay in pain afterwards. If you plan on hiking up either mountain inside the park (Machu Picchu Mountain or Huayna Picchu) I recommend paying the $10 to take the bus to the entrance instead so that you still have the strength and energy to hike these strenuous trails. As the mist rolled in and out over the mountains, we wandered through the ruins. After learning about the various temples we hiked Waynapicchu Mountain, and we attempted without much success to spot the condor shape of the Incan city from the viewpoint at the top. All and all it was one of those completely perfect and memorable trips that will stay with me fondly forever. The famous world wonder did not disappoint and felt just as majestic the second time around. I look forward to the day when I’ll roam through its mysterious walls again. Whether you choose to trek to Machu Picchu via the Inca Trail, the Salkantay Trek, the Jungle trek, or simply visit the world wonder via train or car, it is definitely one world wonder you won’t want to miss. Después de un montón de investigaciones decidimos en http://rainbowmountainperutrek.com/ . Reservamos a través de correos electrónicos de Australia y posiblemente pagamos una pequeña prima (en comparación con el trueque por un mejor precio una vez en Perú), sin embargo, teníamos la tranquilidad de que la caminata se organizó antes de llegar a Cusco y podríamos irnos cuando quisiéramos. Fueron geniales (guías de ingles, comida increíble, carpas y equipos de calidad, la experiencia general y todo incluido, aparte de los consejos, las cervezas extrañas y los refrescos) y no tuvimos ningún problema.